While the Supreme Court is lagging in releasing its decisions this term, the justices wrapped up hearing oral arguments almost a month ago. 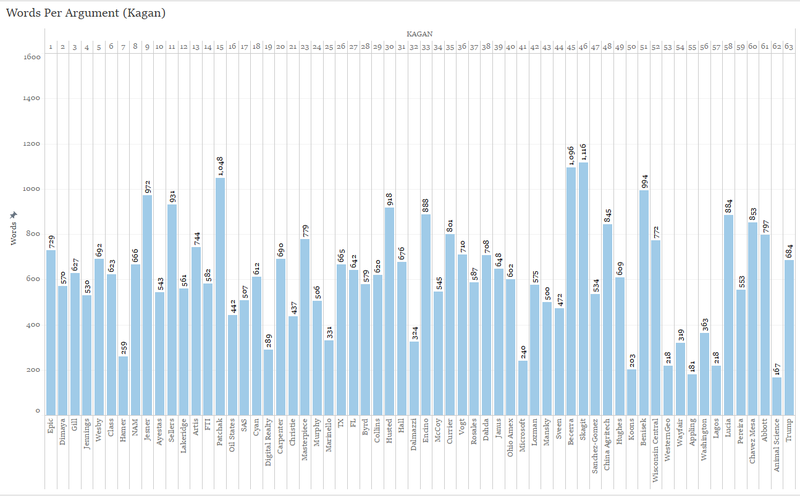 The justices heard 63 oral arguments between October 2017 and April 2018. Within that block of time many expectations were reaffirmed while several new paths were blazed. While the justices’ positions are sometimes predictable and their interactions are occasionally telling of their positions on the merits, much is still left on the table after oral arguments are complete. More to the point of this post, oral arguments occur in a sequence with one or two per argument-day over the course of a seven month period. While certain insights can be gleaned from reading a transcript or by listening to an argument, much of the material that can be used to make inferences about the justices’ positions or on case outcomes is not particularly glaring. 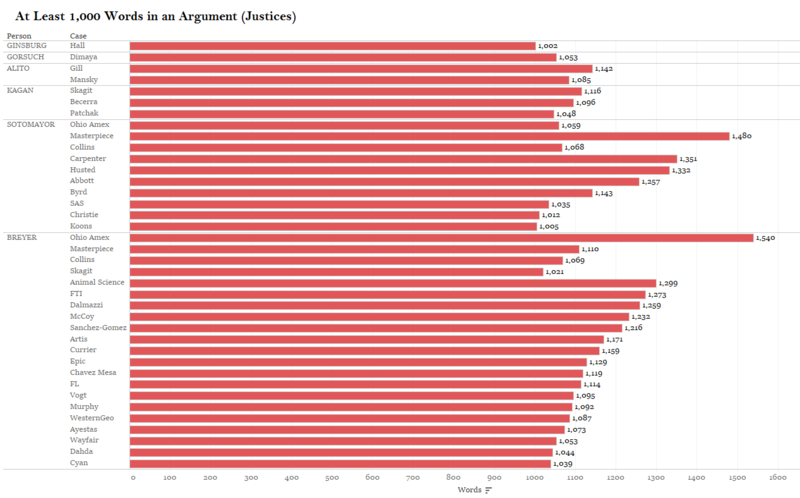 Across 63 arguments this term the justices and attorneys averaged 9,666 combined words spoken per argument. That’s almost 10,000 words per argument fraught for analysis and that permeate the multiple interactions and decisions all actors make while participating in oral arguments. Activity at oral argument is not as straightforward as one might surmise. For instance, not all justices engage in every oral argument. For even the casual Court watcher, Justice Thomas’ lack of participation (he was silent at oral arguments this term) should not have come as a shock. Less bandied about though is the fact that not all of the other justices choose to speak at each oral argument. 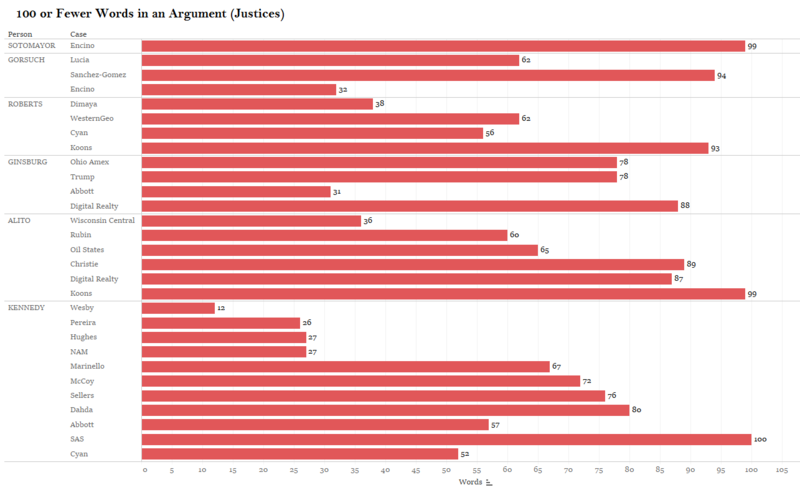 Looking at the number of arguments with the justices’ active participation we see that only three justices – Ginsburg, Roberts, and Sotomayor – spoke at every oral argument this term. This baseline of participation affected the justices’ relative contributions to oral arguments this term. Several, but not all of the instances of non-participation are products of recusals. These include one for Kagan, one for Kennedy, and three for Gorsuch. All occurrences of non-participation for any reason are treated similarly in this post. This justice-level participation can be broken down further into individual arguments. The following graph shows the justices’ relative contributions by percent to the total words spoken by all justices at each oral argument. The arguments are ordered chronologically by argument day. 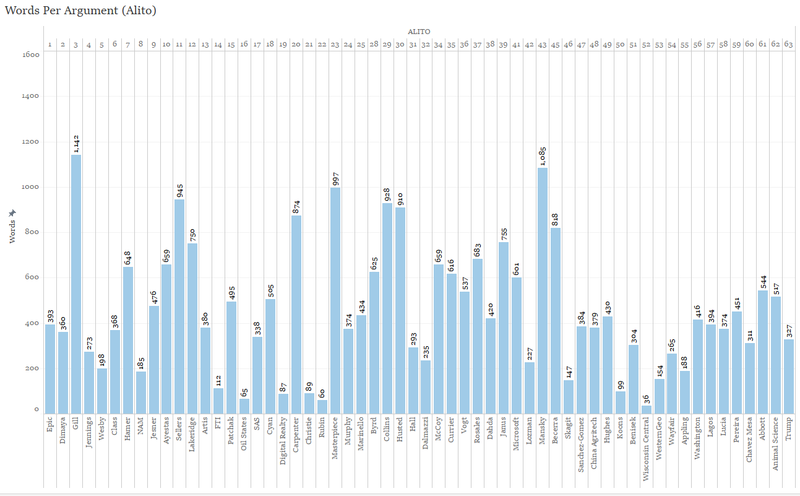 Overt and subtle details about the justices’ participation are covered in this graph. Combining this with the previous graph we can note that the one argument where Justice Kagan did not participate was Rubin v. Islamic Republic of Iran (a product of her one recusal this term). 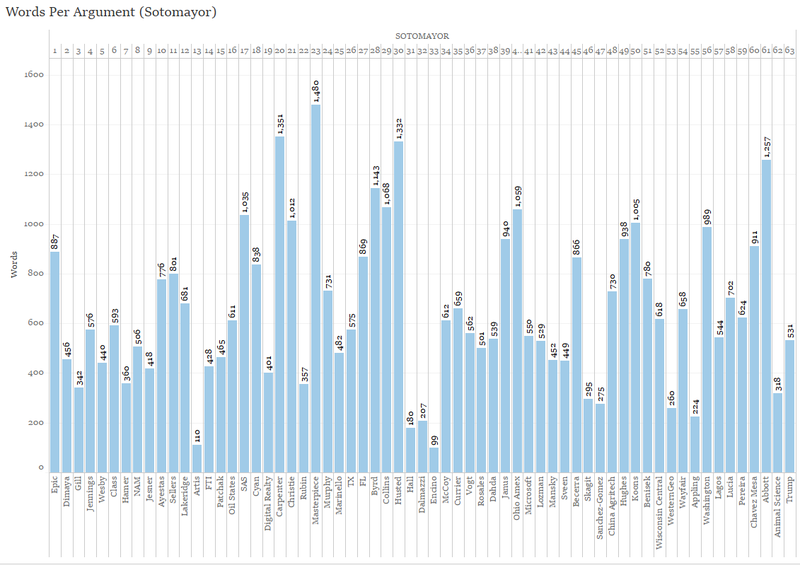 We can also note that Justices Breyer and Sotomayor tend to speak the most of the justices across oral arguments. Even with their regularly high level of participation, these two justices were more dominant in some oral arguments than others. 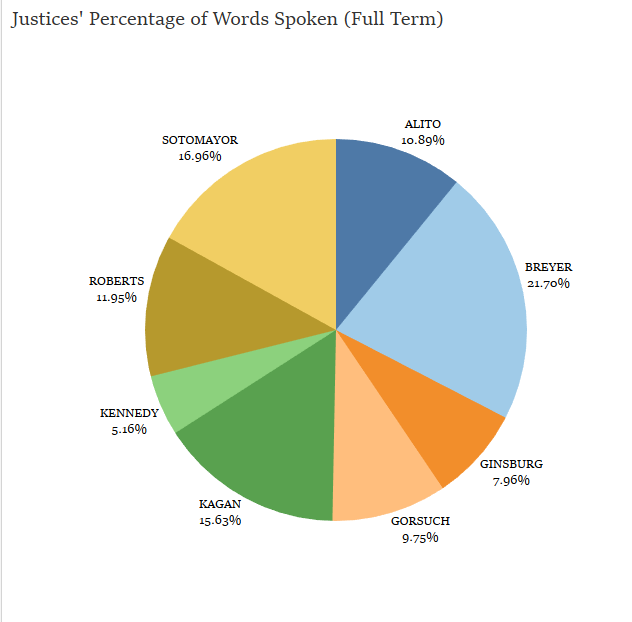 Justice Breyer spoke nearly 40% of the words from all justices in WesternGeo, while Justice Sotomayor spoke over 42% of the words from all justices in Koons. This leads to the breakdown of the justices’ relative participation across all oral arguments this term in the aggregate. The top two speakers have already been highlighted. Justice Kagan spoke next most after Justice Sotomayor while the Court’s right wing members (aside from the silent Justice Thomas) each spoke a similar amount to one another this term. 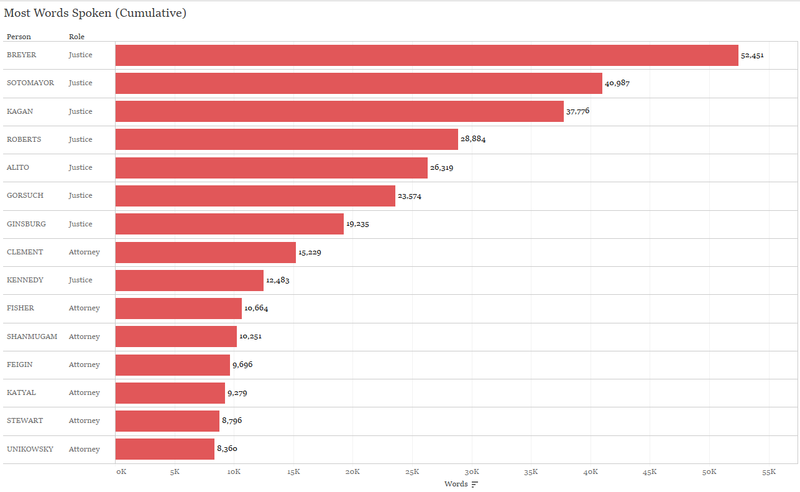 Justices Kennedy and Ginsburg, traditionally two of the less vocal justices at oral argument, did not alter their behavior this term with Justice Kennedy speaking the least with just over 5% of the total words from all justices. 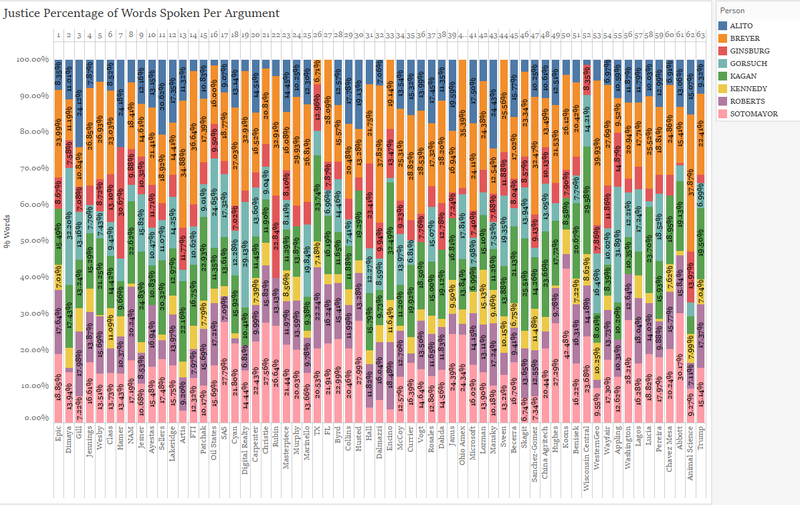 We can take a different vantage on the various actors’ contributions to oral argument by looking at the cumulative amount of speech in each individual argument as is shown in the figure below. The number of words spoken was at the high end in Masterpiece Cakeshop and Carpenter, two of the more heavily anticipated cases of the term, while it was minimized in cases at the opposite end of the spectrum like Hamer and Rubin. Several attorneys were repeat players across these 63 oral arguments. These attorneys are spotlighted below. Private attorney Paul Clement participated in the most oral arguments followed by government attorneys Jeffrey Wall and Malcolm Stewart. Even though individual attorneys only participated in a modicum of arguments across the term compared to the justices, some were able to contribute quite significantly in these limited instances. 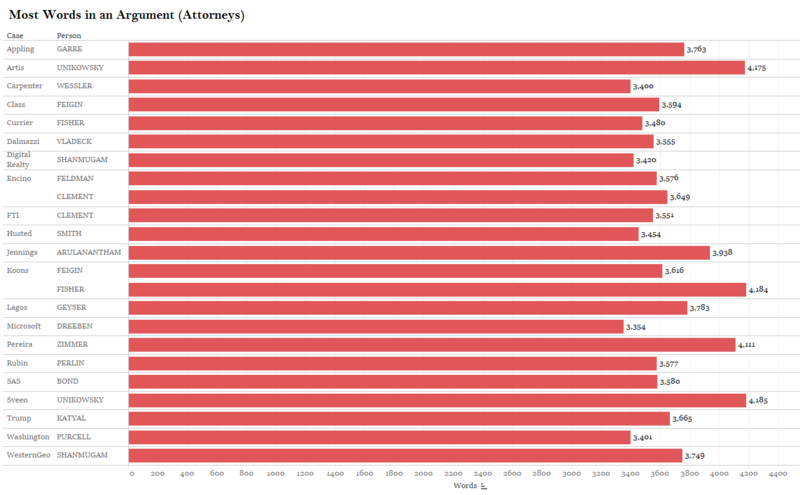 When we look at the top speakers (justices and attorneys) cumulative words spoken across the term, we see that several attorneys are in the mix. Clement, for example, spoke more words in his six arguments than Justice Kennedy in his 58. Kannon Shanmugam, Jeff Fisher, Eric Feigin, and Neal Katyal each made substantial contributions in three arguments apiece. Not far behind them follow Malcolm Stewart with his five arguments and Adam Unikowsky with his two. Examining the participation of attorneys in a bit more detail, we can gather more information about their involvement at the case level. 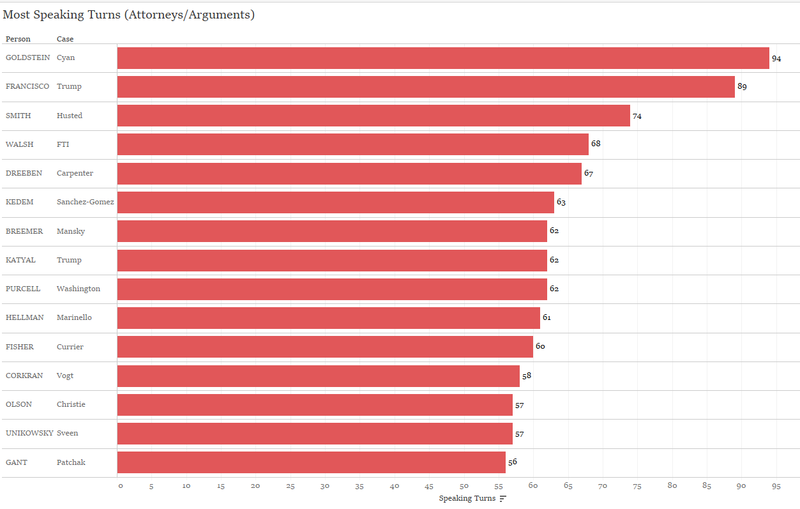 Below are the attorneys that spoke the most words per argument. Adam Unikowsky’s high level of involvement in the cases he argued is apparent from this figure as well as the one above it. Some of the other attorneys already mentioned including Kannon Shanmugam and Jeff Fisher made substantial word-based contributions at the case level. Others like first time arguer Steve Vladeck made strong impressions even in light of their lack of experience before the justices. Looking at this question a bit differently, we can also order the advocates based on the greatest word-contributions in terms of words spoken in individual arguments. This analysis is detailed below. Of this list of attorneys’ participation, four attorneys had over 4,000 words spoken in an argument. These include Adam Unikowsky in Artis, Eric Feigin in Encino Motorcars, David Zimmer in Pereira, and Adam Unikowsky again in Sveen. While these attorneys were able to articulate a lot of substance during oral arguments, they did not all have equal opportunities to do so. Some made the most of fewer opportunities while others provided curt responses across many turns talking. 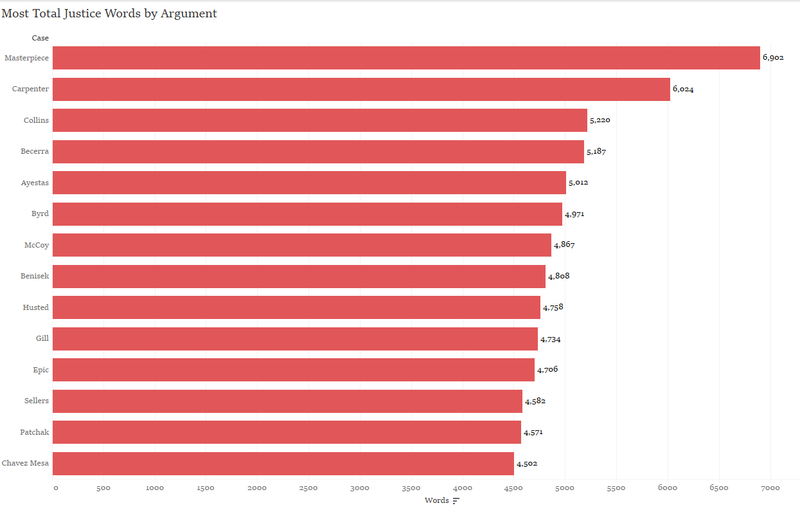 The breakdown of attorneys with the most speaking turns by argument is shown next. 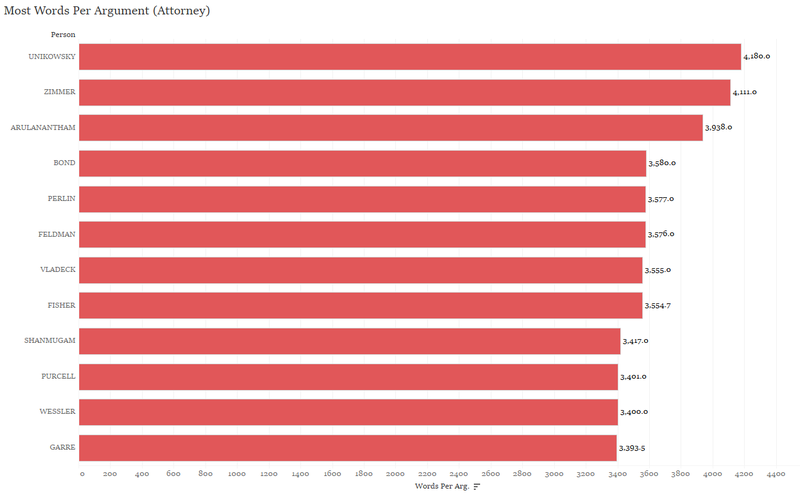 Tom Goldstein with his argument in Cyan and Solicitor General Noel Francisco with his argument in Trump v. Hawaii far surpassed other attorneys in their total talking turns. 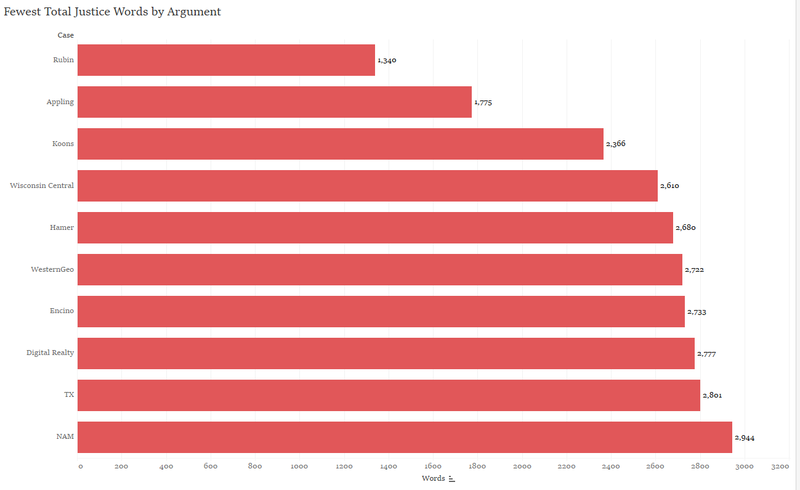 Several of the attorneys with the most words in an argument also appear in this figure including Neal Katyal with his argument in Trump v. Hawaii as well as Jeff Fisher with his argument in Currier and Adam Unikowsky with his argument in Sveen. Unlike particular attorneys, Supreme Court justices are engaged in each oral argument over the course of the term. Even the reticent Justice Thomas is often caught perusing briefs while on the bench. Still not all justices are equally engaged and their type of engagement varies as well. The first way to view the justices’ relative engagement is through their words per argument across all arguments in which they participated this term. 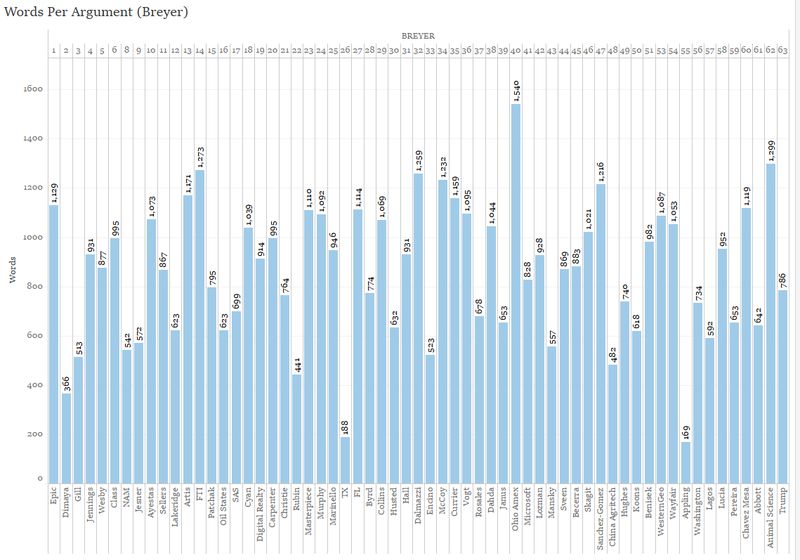 The lead speaker at oral arguments for the past several terms, Justice Breyer, once again was the most active speaker by a large margin. Justices Sotomayor and Kagan have also helped lead the way in terms of justice speech over the past several terms. 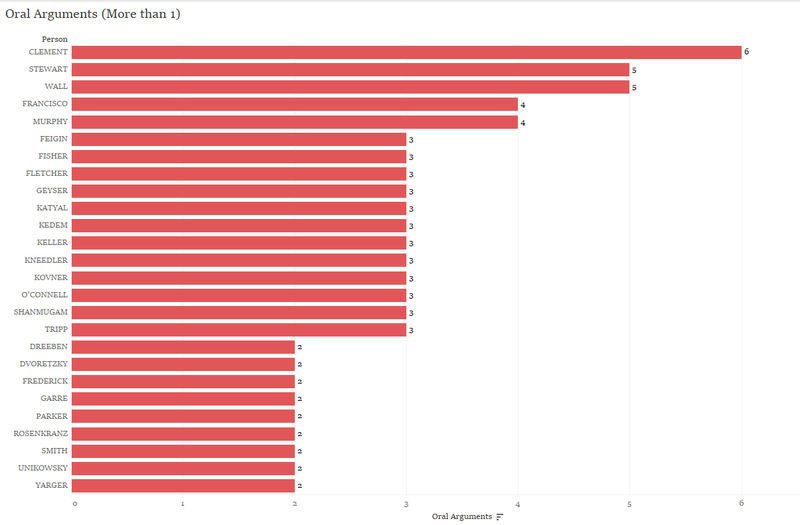 While Justice Scalia was not the most gregarious of justices at oral argument at least in terms of total word output, Justice Gorsuch seems to be lagging behind Justice Scalia’s model as he was the justice to average the third fewest words per argument in which he participated. Even when justices participate in oral arguments they are occasionally minimalists. 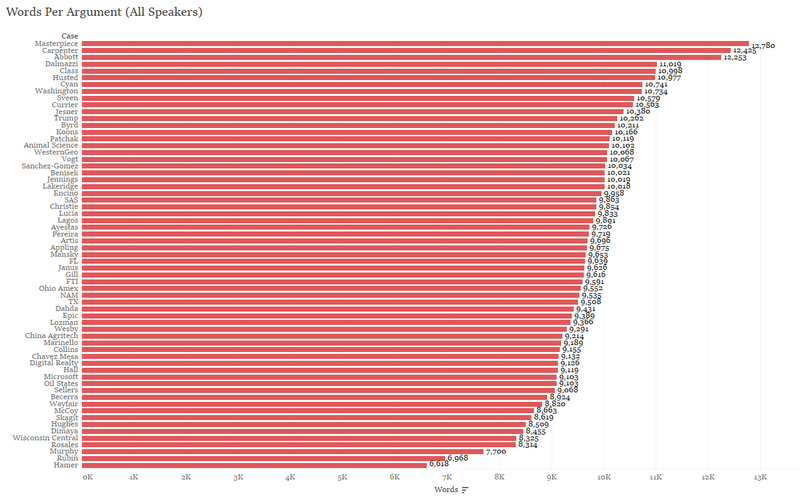 In 29 instances this term, justices spoke 100 words or fewer in an oral argument. 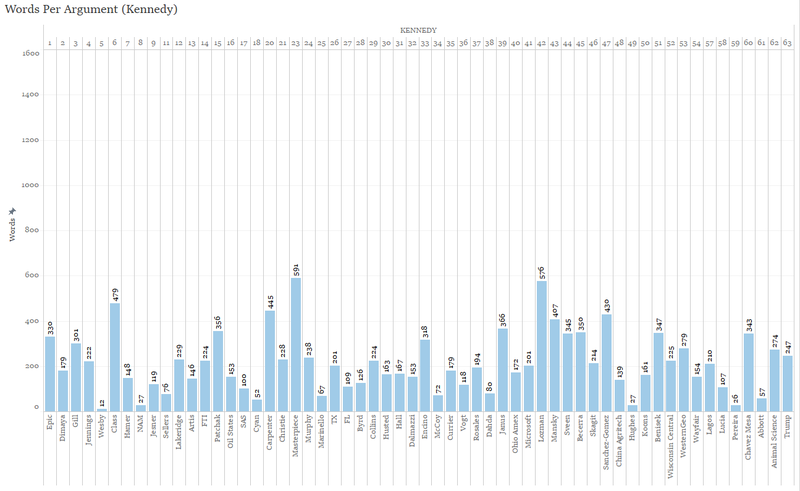 Not surprisingly given his low output across the entire term, Justice Kennedy had the most such instances among the justices. Still, five other justices are also covered in this figure and the only justice in this figure with just one instance of 100 words or fewer in an argument is Justice Sotomayor. This goes toh show that the justices (possibly with the exception of Justice Breyer) put a disparate amount of energy into various oral arguments, and that Justice Kennedy pensively chooses when to engage. 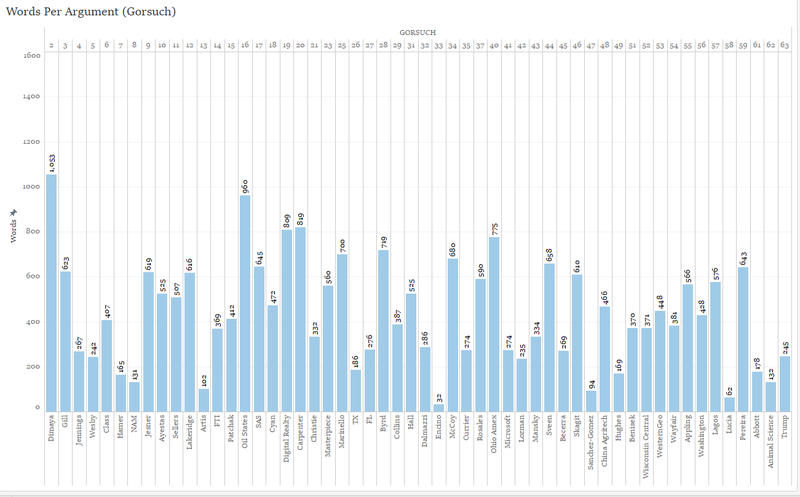 The justices also cumulatively vary in their engagement from case to case. In certain oral arguments this term they had little to say across the board. The justices as a unit spoke much less in Rubin and in Appling than they did in other oral arguments this term. Both of these cases were seen as less salient than some of the blockbusters like Masterpiece Cakeshop and Gill v. Whitford. It is possible that the justices as a whole modulate their involvement based on a variety of factors including the perceived importance of cases. When we look by contrast at the cases where the justices as a whole engaged in the most actively this term, we see cases that engendered the most public scrutiny towards the top. The justices, not surprisingly, spoke the most in Masterpiece Cakeshop and spoke well more in that case than in any other this term. The arguments where they spoke the second most were in the highly anticipated Fourth Amendment case of Carpenter v. U.S. 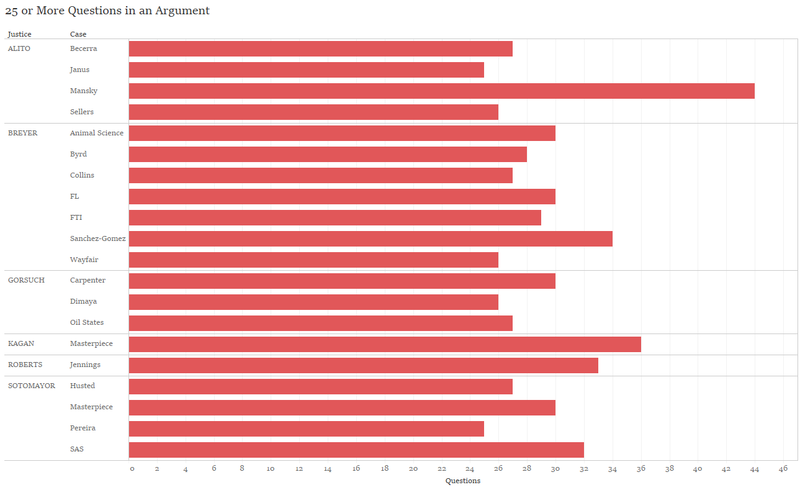 Although this is not a clear indicator of case salience, this as well as the variation in justices’ speech in oral arguments across the term shows that they are not equally engaged in each case. Justice Sotomayor usurps the speaker role more than any of the other justices. Justice Breyer takes the second most talking turns of the justices and yet speaks volumes more than any of the other justices. 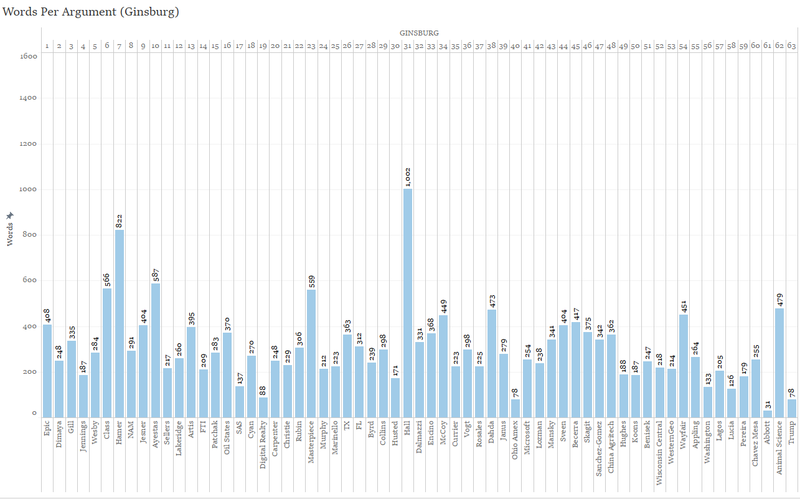 The justices aside from Justice Thomas that speak the least – Ginsburg and Kennedy – also take the fewest speaking turns. 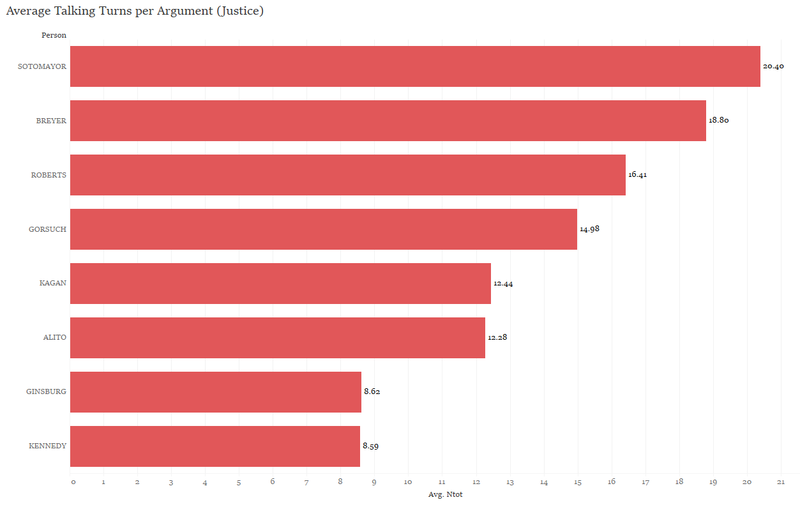 Justice Breyer’s dominance in terms of total speech is immediately apparent when we look at the arguments where justices spoke the most this term. The threshold I set for this figure was at least 1,000 words in an argument. Breyer alone had more arguments with at least 1,000 words than the rest of the justices combined. He also had the most words in an argument this term in the American Express case. Justice Sotomayor had the second most words in an argument in Masterpiece Cakeshop. 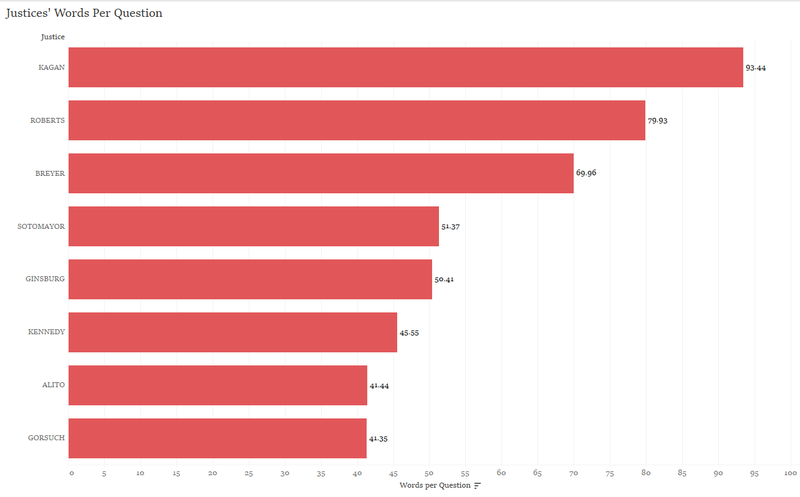 The justices have varied uses for their speaking opportunities as some choose to ask more questions than others (I use question marks as the marker for questions in this analysis). 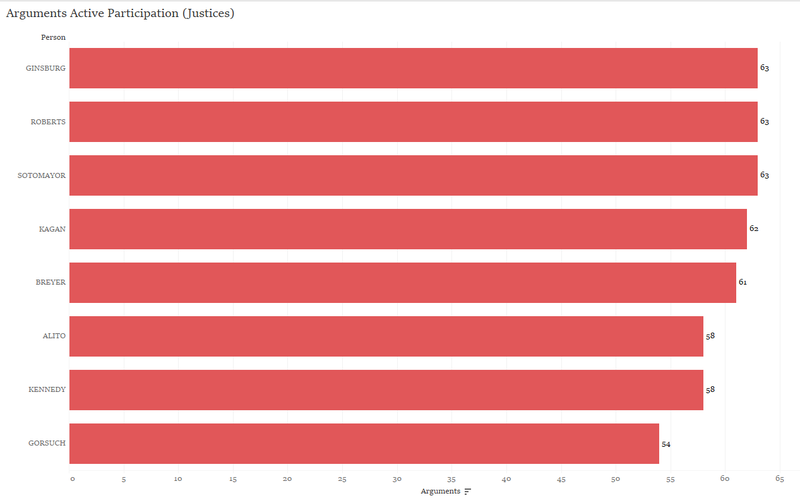 The instances where justices asked 25 or more questions in an argument this term are shown in the next figure. While Justice Breyer had 25 or more questions in more arguments this term than any of the other justices, Justices Gorsuch, Alito, and Sotomayor each had several arguments with more than 25 questions as well. This is particularly interesting because although Sotomayor was one of the most active speakers this term based on their spoken word counts, Alito and Gorsuch were not. 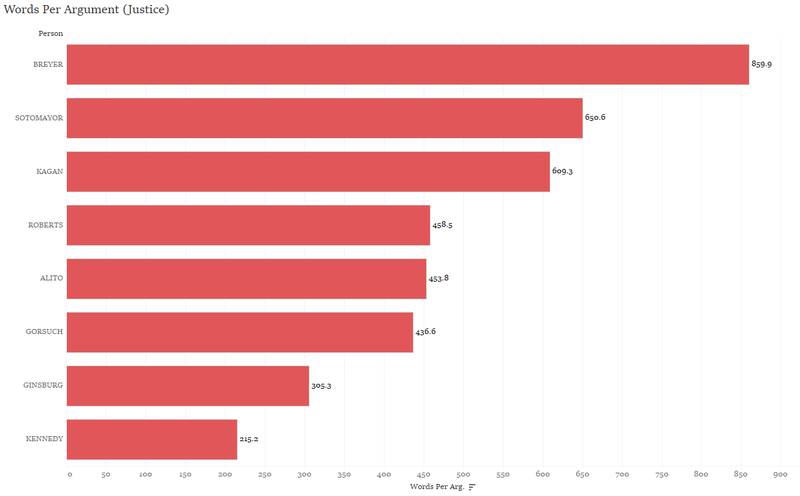 The next set of figures dig deeper into the justices’ word count participation on the individual case level. 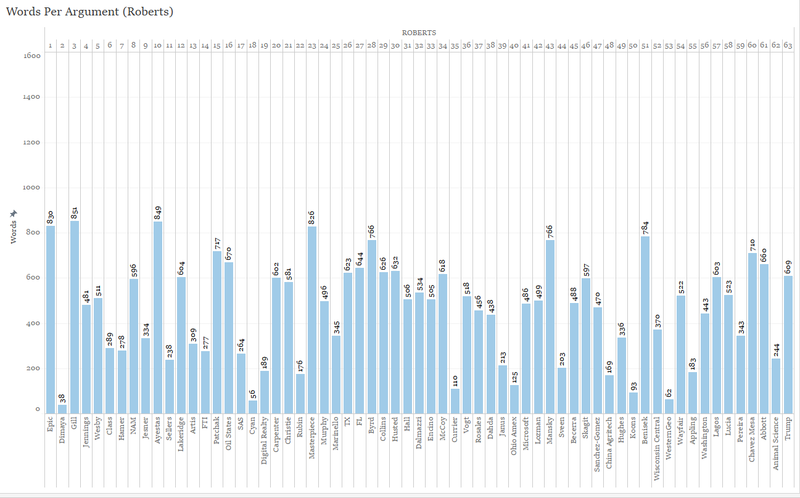 Each graph charts a justices’ unique behavior so that we can see when they chose to engage with the attorneys more and less often. Beginning with the ever-enigmatic Justice Kennedy we can see signs of varied, yet often minimal, participation. Justice Kennedy spoke most at the Masterpiece Cakeshop oral arguments, and also contributed a significant amount during arguments in Lozman, Class, and Carpenter. He had little to say in multiple arguments as well with 12 words in Wesby, 26 in Pereira, and 27 in both Abbott and NAM. Ginsburg reached the 1,000 word marker in one argument this term – Hall v. Hall, which interestingly was just about at the midpoint for arguments this term. She added over 800 words in Hamer. On the other end of the spectrum she only spoke 31 words in the Abbott case. Justice Kagan was much more actively involved in oral arguments than the previously mentioned justices. Kagan had multiple arguments with over 1,000 words including in Skagit where she had a word count of 1,116. Even when Justice Kagan spoke less, she had over 100 words per argument and so she was more active on a regular basis than Justices Ginsburg or Kennedy. Moving in the direction of the most active justices at oral argument, Sotomayor was regularly near the top in terms of words spoken at oral argument. The trajectory of Sotomayor’s speech pattern is notable as well. Sotomayor appeared to start out slowly and to increase her input into oral arguments through the first part of the term. After around the midpoint she spoke less once again only to increase her words per argument a second time towards the Court’s final sitting of the term. Breyer, while apparently never at a loss for words at oral argument, had variation of his own. With 21 arguments or 1/3 of the total arguments for the term in which he spoke at least 1,000 words, Justice Breyer often had more to say than any of the other justices. Still, Justice Breyer spoke minimally (at least in a relative sense) in several cases during the term including in Dimaya, which not only was one of the more important cases of the term, but also divided the justices leading to a 5 to 4 split decision. The remaining three justices that spoke during oral argument showed the greatest variation in their oral argument speech patterns. First, Justice Alito was often very involved or hardly involved at all in oral arguments this term. Alito had multiple argument with over 1,000 words and several more with over 900 words. He spoke his most in two of the voting rights cases this term – Gill and Mansky. On the other hand, he had little to say in several hot-button cases including the Murphy (previously Christie) case dealing with the legalization of sports betting and the important patent case Oil States. While less active across the board and with no 1,000 word arguments, Roberts was fairly consistent in his participation at either a moderate or low level during most oral arguments. Roberts had very little involvement in the Dimaya argument as well as in some of the less discussed cases of the term. He was more involved in several of the term’s most salient arguments including in Masterpiece Cakeshop and Gill v. Whitford. Like Justice Alito, Justice Gorsuch appeared to engage deeply in certain arguments and to predominately avoid speaking in several other arguments this term. This juxtaposition might have been most apparent at the beginning of the term where Gorsuch did not speak at all during the Court’s first argument of the term – Epic Systems­ – and then spoke more than he did in any other argument this term in the next argument – Dimaya. Although Justice Gorsuch hovered around 100 words or fewer in a handful of arguments this term he was one of the most vocal contributors in several of the term’s most important cases including Oil States and Carpenter. The justices each treat oral arguments differently as is apparent from their behavior in arguments this term. Some of this is made clearer in the next figure that looks at the frequency of the justices’ questions based on their words per question. The justices at the top of the figure tend to say much relative to the number of questions they ask. In this respect they may be seeking different types of information than some of the other justices. As Justices Kennedy and Ginsburg speak the least at oral argument, they appear to efficiently choose when to engage. Justices Alito and Gorsuch speak the least per question indicating that they tend to frame their speaking turns around questions. These two justices are also exceptionally close in their words to questions ratios which may be meaningless or may mean they have similar goals for oral arguments. With most of the cases this term still undecided and oral arguments complete, the justices have many cases to resolve based at least in part on the information provided during oral arguments. In each of their unique ways, the justices used oral arguments to reach certain conclusions about their positions and the positions of their colleagues. This term’s arguments helped give us a much better sense of how Justice Gorsuch fits into the oral argument schematic as a justice that may participate little if at all in certain arguments and dominate the discussion in others. With several of the older justices’ dwindling participation in oral arguments, other justices – particularly Breyer, Sotomayor, and Kagan – have had the opportunity to fill any such voids in the conversation.